“Alexander-Heaton and Gabriell’s vividly illustrated, poetic picture book introduces children to the magic of nature. Today’s kids will eventually inherit a planet whose natural resources and ability to sustain life will be rapidly dwindling. Author Alexander-Heaton and designer Gabriell have set out to create a fun way to teach young children about the importance and fragility of nature, using both rhyming poetry and mixed-media illustrations. Alexander-Heaton, who grew up in rural Manitoba, had a childhood characterized by a love of the wilderness, and her debut aims to encourage a similar perspective. 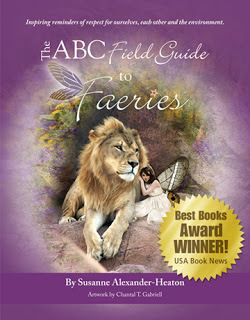 What sets this book apart from other eco-aware titles is Alexander-Heaton’s inclusion of an imaginary world of fairies. Each fairy represents an aspect of nature and serves as its guardian. Quinella, for example, is “the ruler of the oceans, rivers and seas,” while Buzzalina flits among the flowers bringing happiness to all creatures. As promised, the book uses each letter of the alphabet as a prompt for both the name of the fairy (“E is for Echinops,” etc.) and for two poems, the first spoken by the narrator as a sort of short biography of the fairy and the second by the fairy him- or herself, encouraging the reader to help protect the butterflies, appreciate a rainbow, refrain from littering or find the silver lining to any cloud. While the rhymes are sometimes wrenched into a strict form, children will probably find a number of them delightful. Adults may find the poems and overall message a bit clichéd and the illustrations a tad treacly (and occasionally uncanny), but children will be drawn to the rich colors and unusual collagelike images. Overall, the work is an inspired invitation to preserve our beautiful planet.